I’ve been working my way through the Interlude line from E.P. Carrillo this year, thus far writing reviews on the Natural Rothschild Jr. and the Maduro Rothschild Jr.
At first, my attraction to the pint-sized cigars was inspired by the temperatures of a Chicago winter; more recently, I’m drawn to the cigars for their ability to pack a premium cigar experience into a short time period—a plus when you’ve got two small children and a third on the way. Ernesto Perez-Carrillo launched Interlude in 2016. There are two blends each presented in two small formats: Carrillitos (4 x 38) and Rothschild Jr. (3.75 x 48). The Natural version of “Ernesto’s shortest cigar ever made” sports a Connecticut wrapper (same as the New Wave Reserva) around Nicaraguan binder and filler tobaccos. The Maduro boasts a Mexican San Andrés wrapper (same as La Historia) around an Ecuadorian binder and Nicaraguan filler. I smoked a handful of cigars in the Interlude Maduro Carrillitos format for this review. 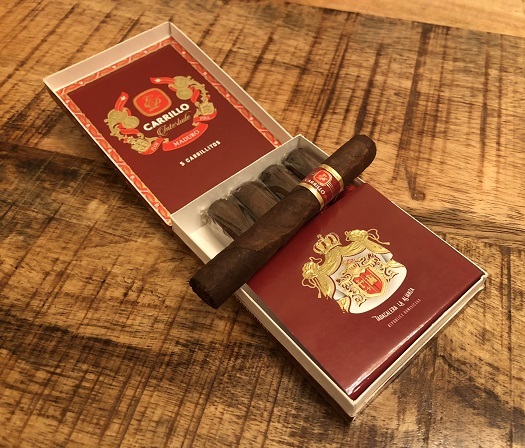 This cigar is neatly presented in a regal five-pack that retails for $15 (or $3 per cigar). The beautiful packaging is offset by the rustic, wrinkled appearance of the wrapper leaf. It is veiny, toothy, and mottled with moderately loose seams. The firm, lumpy Maduro Carrillitos has a stiff cold draw and pre-light notes reminiscent of cocoa powder and damp earth. A single match is all that’s needed to establish an even burn. Once underway, I find a medium- to full-bodied profile of black pepper spice, cherry sweetness, dark chocolate, and cedar. After a quarter-inch or so, the draw mercifully opens up nicely. At the same time, there is a shift in flavor away from spice and towards creaminess. Here, flavors include dry oak, marshmallow, and café au lait. This is where things remain until the final third, which is characterized by a reprise of black pepper and cedar spice. The physical properties are outstanding. All of my samples exhibited straight burn lines, sturdy ashes, and good smoke production. The only blemish is the tight draw at the outset. When I started to get serious about cigars about 12 years ago, the most challenging scarcity was the cost of the hobby. Now, the biggest constraint is time. I can’t seem to carve out 90 to 120 minutes nearly as often as I would like. That’s why the Interlude series strikes a chord with me. E.P. Carrillo found a way to deliver much of what I love most about cigars into more manageable formats. For that, I’m thankful. I’ve especially been impressed with the San Andrés-wrapped Maduro Interlude cigars. Like the Rothschild Jr., I’m awarding this one a very solid rating of four stogies out of five. Sooooo. . . . Where are these available? No major online tobacconist I’ve seen have them (Famous, Mike’s, JR, Holt’s, Cigars International, Cigar Place, etc. etc. ), and my local cigar supplier doesn’t, either. Have they been discontinued? Know what you mean about time. Didn’t really start to smoke cigars until I retired. Just didn’t have the time. I smoke pretty slow and weather in the KC area can be almost as nasty as Chicago in the winter. A good small cigar is needed at times. Thanks for the article and congrats on the up coming baby.